 USA  1966  106m   Directed by: John Frankenheimer.  Starring: Frank Campanella, John Randolph, Frances Reid, Barbara Werle, Edgar Stehli, Aaron Magidow, De De Young, Françoise Ruggieri, Murray Hamilton, Thom Conroy, Jeff Corey, Will Geer, Richard Anderson.  Music by: Jerry Goldsmith. 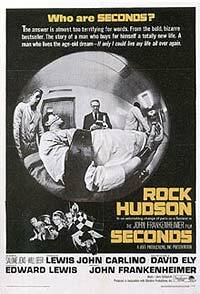 John Frankenheimer's SECONDS--one of the most original and disturbing studio films from a decade of original, disturbing and innovative cinema. This is a movie of many qualities-- dramatic, paranoid, and nightmarish. Some have compared it to an extended episode of The Twilight Zone. Some have called it a Faustian science-fiction parable, or a "thinking man's thriller". Not a true science-fiction film (science of any kind is never discussed in it). It's an existential nightmare. Perhaps it could be called an adult horror film. But a question may arise at its presence here: is SECONDS a Film Noir? Obviously, SECONDS does not immediately appear to fit the Film Noir genre ideally. It's not a crime drama, and a typical dark visual style does not dominate the film. It's not easily termed a "Neo-Noir" either for similar reasons. Yet SECONDS does have components drawn from Film Noir that work to create an overwhelming sense of fatalistic doom. This is not a crime film, but at its core is a deep transgression: the tragic betrayal of the self. Synopsis: Let down and bored by a stereotypical, suburb-living, Manhattan-working lifestyle, a 50-something business man decides to exchange his body, and thereby his entire life, for a new one. Thinking he will give himself a second chance at happiness, Arthur Hamilton realizes only when it's much too late that he will always remain who he is, despite any outward alteration of self. This deeply unhappy man is trapped in his miserable identity and there is no escape. No escape. This is a common Noir theme, a pervasive sense of entrapment. Sometimes dark, and often disorienting black-and-white camera work by James Wong Howe creates a universe of paranoia in SECONDS. Whom can Arthur trust? What exactly is going to happen to him when he gives his body over to the corporation with whom he has made a life-altering pact? Every person he encounters before his change is ambiguous: Mr. Ruby (brilliant Jeff Corey) who eats chicken while detailing Arthur's contractual obligations, Charlie Evans (Murray Hamilton), Arthur's old friend who is waiting to undergo a change himself. Along the way, there is a drug-induced episode in which Arthur appears to display indecent behaviors. A film of these behaviors, he is told, will be used against him should he back out on his contract. Arthur is trapped. He is threatened with blackmail, and his own death is faked by the corporation (evidently using some unfortunate victim in his place). After the operation, and now re-named "Tony Wilson", Arthur meets Nora Marcus (Salome Jens) and "The Old Man" chilling Will Geer), neither of whom give him any feeling of stability or comfort. But there is no turning back. As Tony Wilson, Arthur thinks he may have found an idyllic new life: but Nora just leads him into a bacchanalian lifestyle that feels like a betrayal of his inner self. After a very dramatic breakdown at a cocktail party (attended only by other "seconds") Arthur decides he wants to go back to his old life. We already suspect it's too late. TonyArthur is calmed by the strange, sinister, yet oddly soothing speech of The Old Man and then led to his final "change", from which there will be no return of any kind. As Arthur Hamilton, John Randolph gives an unforgettable performance, showing a perfect understanding of the weary, disappointed man he portrays. Early in the film there is scene with his loving wife (Frances Reid): he rejects her physical advances and the moment perfectly conveys Arthur's dissatisfaction and sad resignation. Rock Hudson gives what is surely one of his best performances as TonyArthur. There is a palpable sense of discomfort and alienation in his performance. A new, handsome exterior means nothing to this man who realizes he has betrayed himself and given up everything that truly mattered in his life. It's a profoundly tragic situation, and Hudson deserves a lot of credit for making it believable. One of the film's best scenes comes when Tony pays a visit to Arthur's "widow". She never realizes who he is and the scene is filled with pain and regret. (In the DVD commentary, director John Frankenheimer tells us that he had intended to include an even more painful scene of TonyArthur going to see the daughter he has left behind.). As for Frankenheimer himself, this is one of his best films by far, never exceeding its ambitions and remaining true to its serious, adult viewpoint. Not a true science-fiction film (science of any kind is never discussed in it) SECONDS is a disturbing, thoughtful and frightening experience. It's an existential nightmare. Perhaps it could be called an adult horror film. It's not a Film Noir in the most literal sense, but its powerful feelings of entrapment, paranoia, self-betrayal and doom--all enhanced by a Howe's disorienting black-and-white cinematography and Jerry Goldsmith's eerie score--give us a prime example of one direction the elements of Film Noir took after the classic period. Review by mackjay2 from the Internet Movie Database. A farfetched sci-fi notion rendered unsettlingly plausible. A very good film that's dying to be great. A movie that went from failure to classic without ever becoming a success. It surprises, shocks, and really makes one think. Seconds Blu-ray Review (The Criterion Collection).